64-bit CPU A 64-bit computer with minimum 4 cores is required for the hypervisor. For more info about Hyper-V, see Hyper-V on Windows Server 2016 or Introduction to Hyper-V on Windows 10. For more info about hypervisor, see Hypervisor Specifications. 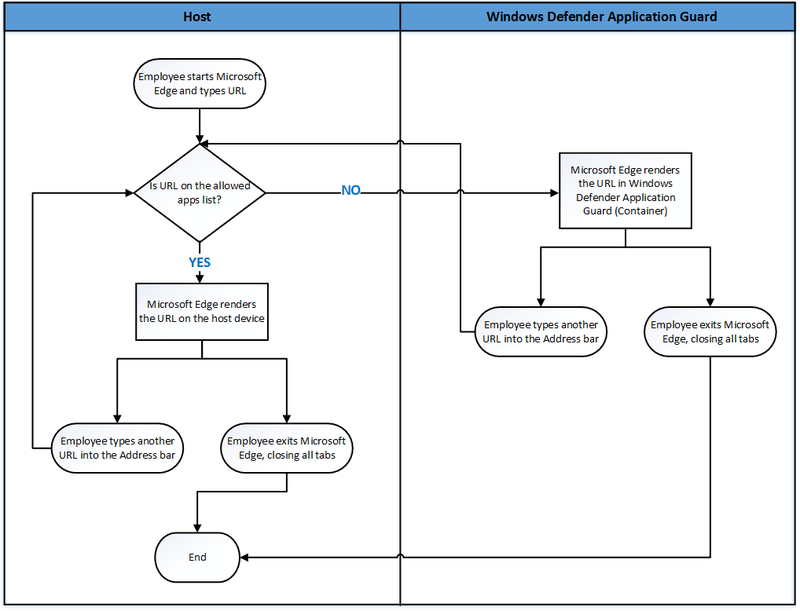 Before you can install and use Windows Defender Application Guard, you must determine which way you intend to use it in your enterprise. You can use Application Guard in either Standalone or Enterprise-managed mode. Employees can use hardware-isolated browsing sessions without any administrator or management policy configuration. In this mode, you must install Application Guard and then the employee must manually start Microsoft Edge in Application Guard while browsing untrusted sites. For an example of how this works, see the Application Guard in standalone mode testing scenario. You and your security department can define your corporate boundaries by explicitly adding trusted domains and by customizing the Application Guard experience to meet and enforce your needs on employee devices. Enterprise-managed mode also automatically redirects any browser requests to add non-enterprise domain(s) in the container. The following diagram shows the flow between the host PC and the isolated container. Application Guard functionality is turned off by default. However, you can quickly install it on your employee’s devices through the Control Panel, PowerShell, or your mobile device management (MDM) solution. Open the Control Panel, click Programs, and then click Turn Windows features on or off. 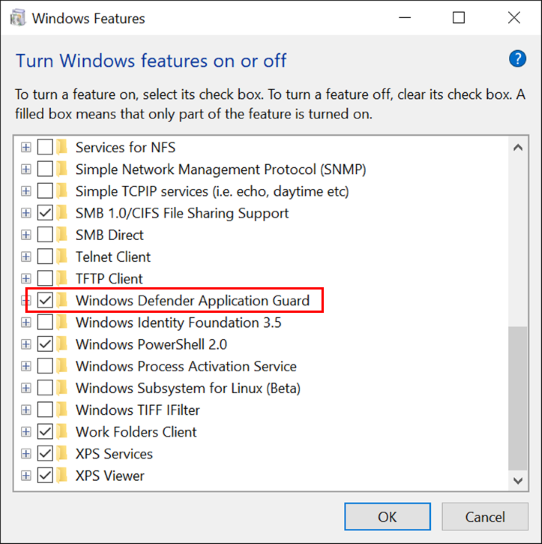 Select the check box next to Windows Defender Application Guard and then click OK. Application Guard and its underlying dependencies are all installed. Ensure your devices have met all system requirements prior to this step. PowerShell will install the feature without checking system requirements. If your devices don't meet the system requirements, Application Guard may not work. This step is recommended for enterprise managed scenarios only. Click the Search or Cortana icon in the Windows 10 taskbar and type PowerShell. Right-click Windows PowerShell, and then click Run as administrator. Windows PowerShell opens with administrator credentials.